Every year lives are lost and millions of dollars in property damage are reported due to chimney fires. 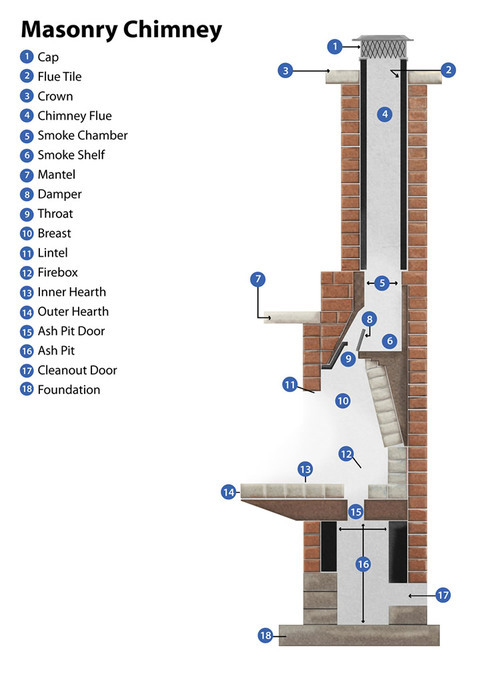 Chimney fires can be prevented by routine maintenance. People often ask how often they should clean their chimney. The answer depends on a few different factors. What kind of wood are you burning, how often do you burn, how hot are your fires, how long do they burn, and the moisture content of the wood. A good general rule is for every cord of wood you burn, you should have your chimney inspected and cleaned. Your chimney, smoke chamber (5), and flue (4) have the very important job of carrying the smoke and other harmful products of combstion to the outside of the house. There are many benefits of a clean chimney. Sweeping your chimney will prevent the buildup of flammable creosote and help your chimney to function properly and efficiently. Creosote can effect the draft / draw / suction of your chimney which can hinder the flow of carbon monoxide and smoke out of your home. If you start to smell an odor that smells like soot or like a fire while the fire is not burning or If you suddenly start getting smoke in your house, these warning signs should not be ignored and can most likely be fixed with a chimney cleaning. When we come out to sweep your fireplace chimney we inspect every aspect of your chimney. From the metal chimney cap (1) to the bottom of the firebox (12). Upon arrival our technition will put drop cloths around fireplace, inspect all parts on the chimney inside and out, top to bottom using the latest video and software technology. Make sure eveything is safe and sound and that there are no holes, cracks, or anything else that could be a fire hazard or affect the proper function and safety of the chimney and fireplace. If there are any repairs needed on the inside or outside, our technicians can write you a free estimate for the repairs. If you would like to request chimney cleaning and/or duct cleaning services, or if you would like to schedule a free estimate, please fill out this form and we will get back to you within one business day.